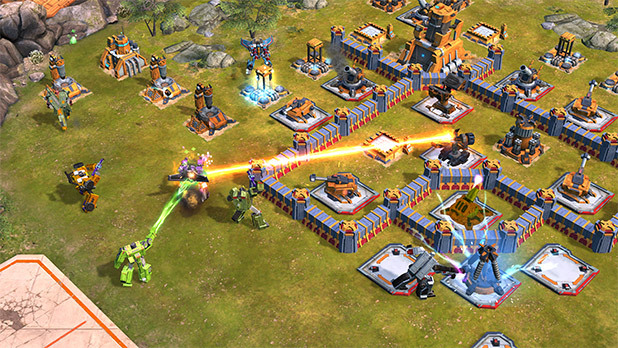 After what felt like an eternity, Transformers: Earth Wars was released for Android and iOS devices. I was pretty excited to play it and was happy to find it the best Transformers mobile game yet! This isn't one of those carbon copy games where you build a city and defend it with gameplay that's really just a series of taps disguised as a next button with endless prompts to spend money. No, this is an extremely fun strategy game. Not only do you build a base and maintain it, but you also follow a story path leading your troops to battle. 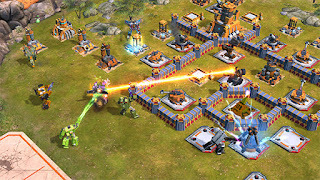 You have the choice to play Autobots or Decepticons, as you progress, more characters join your group through means of completing campaigns or acquiring the gems that power the space bridge to randomly bring in more bots. I've been having a hard time putting down my tablet, the game is tailor made for Transformers fans. There's a ton of characters, even some you'd not expect to find in something outside a comic. The dialog between characters is great and the story progresses naturally. Simon Furman has worked on the game and even some of his trademark phrases found their way in. I've yet to try the PvP mode, but from going by others, it's a lot of fun. There is a nifty ongoing chat, which I've poked into a few times. It's nice to be excited for a new game, but it's better to be completely satisfied by it. I hope Earth Wars stays around for a while, because I don't plan on giving up on it.